True stories inspired by one of the most iconic, beloved, bestselling books of our time. In the ten years since its electrifying debut, Elizabeth Gilbert’s Eat Pray Love has become a worldwide phenomenon, empowering millions of readers to set out on paths they never thought possible, in search of their own best selves. Here, in this candid and captivating collection, nearly fifty of those readers—people as diverse in their experiences as they are in age and background—share their stories. The journeys they recount are transformative—sometimes hilarious, sometimes heartbreaking, but always deeply inspiring. Eat Pray Love helped one writer to embrace motherhood, another to come to terms with the loss of her mother, and yet another to find peace with not wanting to become a mother at all. One writer, reeling from a difficult divorce, finds new love overseas; another, a lifelong caregiver, is inspired to take an annual road trip, solo. A man leaves seminary, embraces his sexual identity, and forges a new relationship with God. A woman goes to divinity school and grapples with doubt and belief. One writer’s search for the perfect pizza leads her to New Zealand and off-the-grid homesteading, while another, in overcoming an eating disorder, redefines her relationship not only with food but with herself. Some writers face down devastating illness and crippling fears, and others step out of their old lives to fulfill long-held dreams of singing, acting, writing, teaching, and learning. 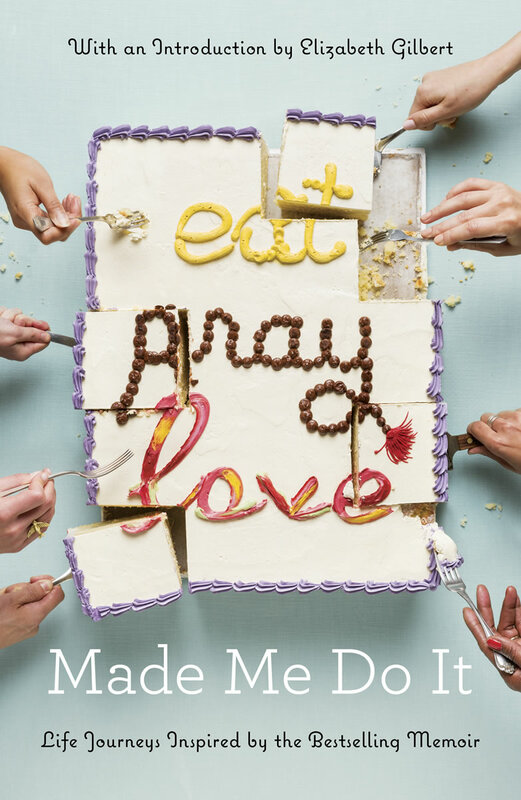 Entertaining and enlightening, Eat Pray Love Made Me Do It is a celebration for fans old and new. What will Eat Pray Love make you do?